Welcome to The Hotham Park website, this site is undergoing some reconstruction. Hotham Park is an area of 9 hectares (22 acres) located in the High Street, Bognor Regis. It first became a public park on 1st January 1947, having been purchased by the former Bognor Regis urban District Council from the executors of the late William Fletcher. Locally, the park is the most important heritage amenity in Bognor Regis. Sir Richard Hotham, the founder of modern Bognor Regis, built and resided in Hotham Park House and grounds. The House remains intact, and forms an intrinsic part of the heritage of the town. The grounds have been eroded since 1947 so that only the walled parkland and nearby Millberry Wood remain as public open spaces. The horticultural interest in the park was chiefly created by William Fletcher between 1900 and 1940. Most of the shrub and herb layers were destroyed in a hurricane in October 1987, but the remnants of a fine tree collection remain. 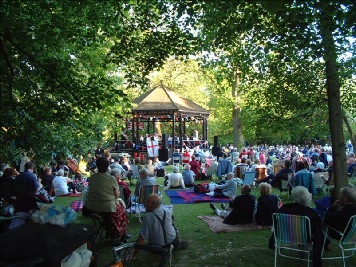 Hotham Park is the only large park to serve the people of Bognor Regis. Some 23,000 people live within half a mile of the park and an estimated 14,000 live within that distance. Public transport links are very good. The park is very close to the town centre, Butlins holiday centre, the University campus, and the sea front.